'My Experiment With Falsehood' Modi's Autobiography; Cartoons Raj Thackeray! Using cartoon as a tool to ridicule or scorn is a thing that runs in the Thackeray family. 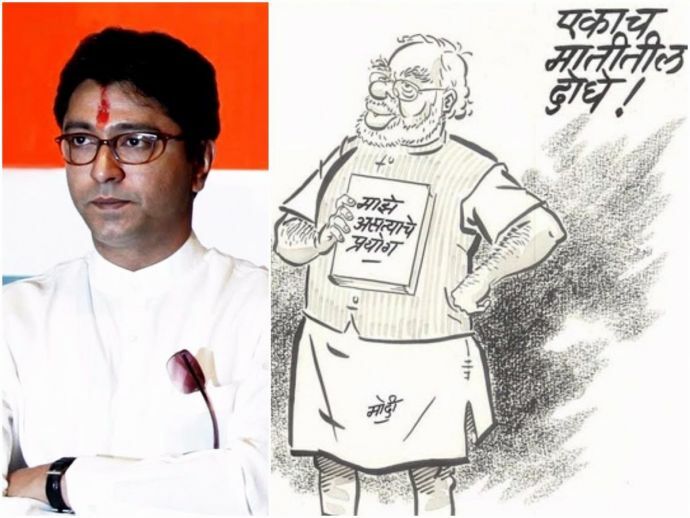 Maharashtra Navnirman Sena chief Raj Thackeray made good of his cartoonist's pursuits by creating sketches of Mahatma Gandhi and Narendra Modi. The caricature had both the personalities standing next to each other and holding their “so-called autobiographies”. 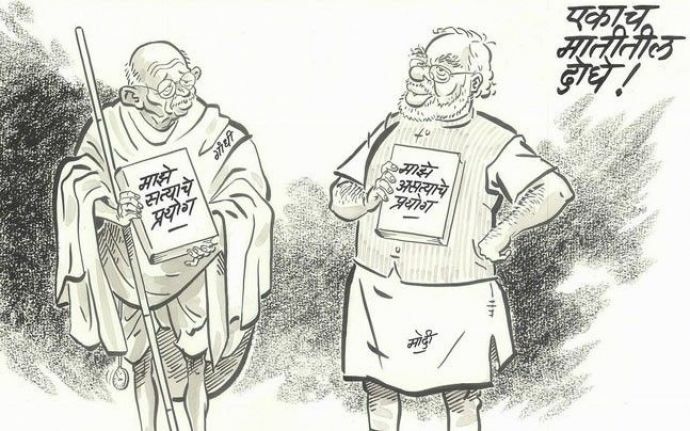 Thackeray’s sketch comes ahead to Gandhi Jayanti and sees two public figures of the Gujarat soil holding their books of 'experiments' up for the reader to see. Raj Thackeray’s mocking-the-PM-through-his-cartoon move isn’t a novel one. 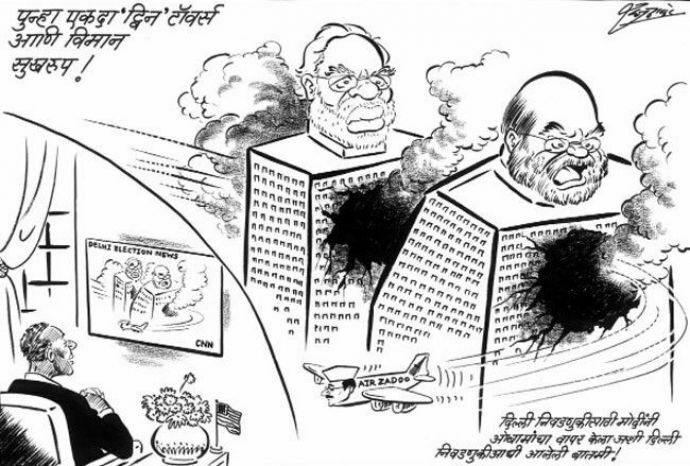 In the past, Thackeray used the 9/11 attack on New York’s Twin Tower metaphor to take a jibe at Modi and his aide, BJP chief Amit Shah after BJP lost the Delhi Assembly elections to AAP’s Kejriwal. Using cartoon as a tool to ridicule or scorn is a thing that runs in the Thackeray family. Raj’s uncle and the celebrated Shiv Sena founder Bal Thackeray was also known for this trait of his. RK Laxman, perhaps the best-known Indian exponent of the art form, was the Sena supremo's colleague at the Free Press Journal in 1947. Even though Shiv Sena is an ally of Narendra Modi’s BJP, Uddhav Thackeray, its current leader, did not hold back while criticizing BJP at an event on Saturday. He brought out many issues like those of demonetisation, increasing petrol prices and cow vigilantism in his speech. The speech revolved around making one thing clear: The Sena is allied with the BJP only for the unity of Hindu votes and nothing else. Raj Thackeray recently called demonetisation a blunder which has resulted in large-scale unemployment and a rise in inflation.